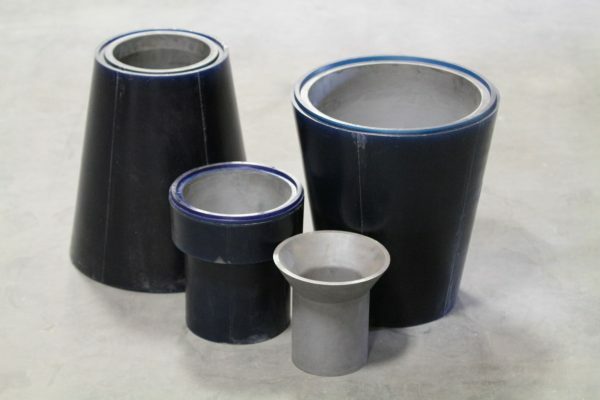 Blasch Precision Ceramics, Inc., an Albany-based ceramic technology manufacturer, announces the launch of VERKAPSE™ — a turnkey solution consisting of polyurethane encased ceramic for applications involving hydrocyclone separators and other mineral processing equipment. Until now, this encapsulation step was completed by a subcontractor, using inserts sourced from ceramic manufacturers. All proprietary silicon carbide based materials – they can be cast into very complex shapes, displaying tight and repeatable tolerances that ensure repeated ease of installation. Expect a more abrasion resistant product than cast steels, rubber and urethanes alone at one-third the weight of their steel counterparts. All offer much higher thermal and corrosion resistance as well. The critical choice of materials in the management of abrasion and wear ranges from steel to rubber to urethane to ceramics. The superior abrasive wear resistance of ceramics is well known, although this desirable characteristic comes at a cost – the brittle nature of ceramics and its tendency to fracture when impacted. This can allow chunks of ceramic to cascade through downstream process equipment. Often rubber or urethane is used to hold the ceramic in place, providing an integral means to absorb impact and vibration while providing some containment function in the event of fracture.